Madeline Hatter, daughter of the Mad Hatter, is throwing a Hat-tastic Party with all her friends to help save the Wonderland Grove from losing its wonder and magic. 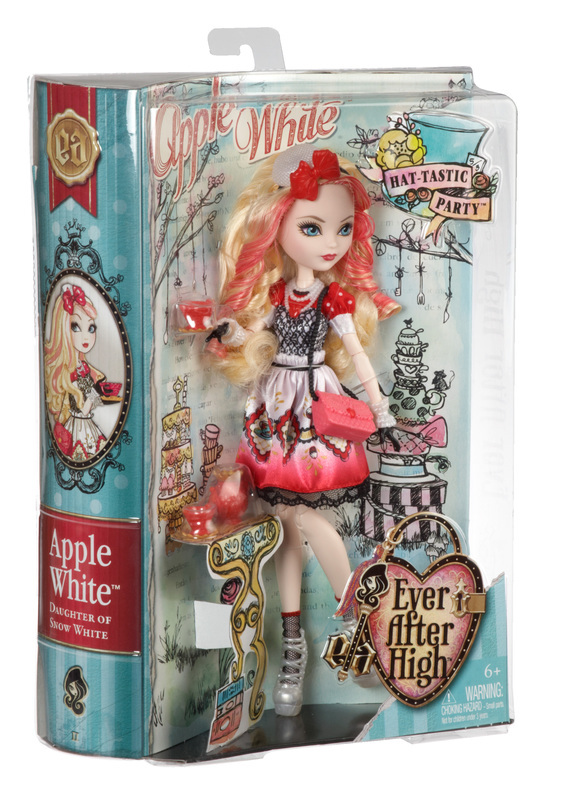 Apple White, daughter of Snow White and leader of the Ever After Royals, is dressed tea-rifficly for the occasion in a modern harajuku-inspired dress. Charming details include a black lace print on the bodice, polka dot sleeves and apple-red and black mesh socks beneath her white and gold heels. A pearl white hat with apple-red bow, unique handbag and “pearl”-beaded necklace are spellbinding accessories. While wearing hexquisite black gloves, she can sip tea in epic style from her apple-red teacup and matching teapot. A special color streak in her enchanting hairstyle adds an extra-modern edge to her fairytale-inspired look. The posable doll’s details make for hexquisite display. Doll comes with purse, hairbrush, teapot, teacup and doll stand. Collect her tea-party friends to expand the guest list. Ages 6 and older. 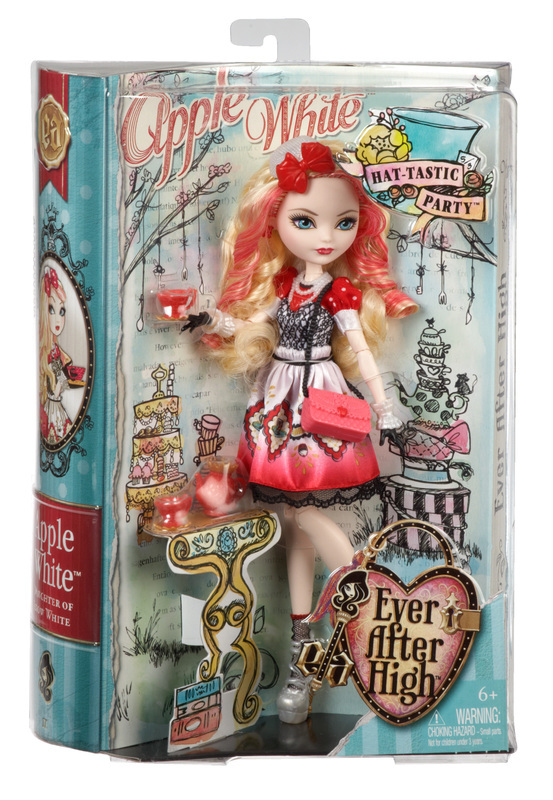 Apple White is tea-rifficly dressed for Madeline Hatter doll’s Hat-tastic Party in a modern harajuku-inspired dress. Spellbinding details include black lace accents, a colorful print and polka dot sleeves. A pearl white hat with red bow and white and golden-heeled shoes are fairest touches. 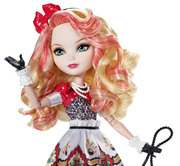 She comes with a personalized tea set in apple red with golden accents.